The Castillo Group invites you and your family to join us for Cookies and Cocoa with Santa November 29th. The weather is getting cooler and delicious cookies and hot cocoa are sure to hit the spot. Santa will be all smiles as he poses for photos with you, your friends, your family, even your dog! Those who attend will have a chance to win some amazing prizes like an Apple TV, gift cards and other holiday goodies. 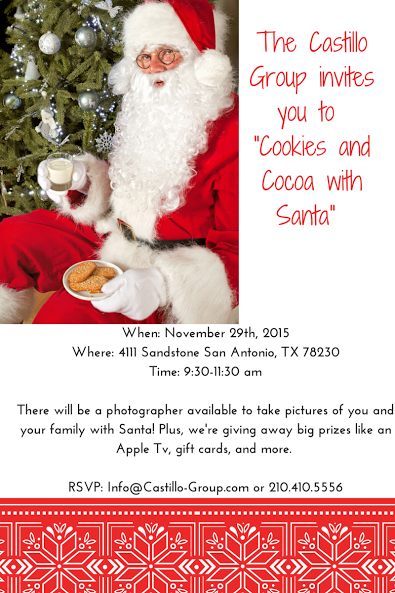 To RSVP, please call 210.410.5557 or email at info@castillogroup.com.